This elegant ring uses the function of a Tibetan prayer wheel to encourage us to meditate. Prana, Sanskrit for "life force," refers to the invisible energy that permeates all things and unites all the elements of the universe. Inspired by this thought-provoking concept, this elegant ring uses the function of a Tibetan prayer wheel to encourage us to meditate on our place in the cosmos and our connection to everything in it. The concept of the prayer wheel is a physical manifestation of the phrase "turning the wheel of Dharma," which describes the way in which the Buddha taught. Prayer wheels are used to accumulate wisdom and merit (good karma) and to purify negativities (bad karma), and with every meditative turn they help bring practitioners ever closer to enlightenment. Keep your hands occupied and your mind clear by slowly rotating the slender center band. Made in Israel. I have always loved spinning rings, they are hard to find and this one is well made, beautiful, light and unique. The ring looked fantastic upon arrival, everything I expected. It both fit and looked great! I ideally wanted to wear it daily, but I wash my hands often with my work. Within the first day I was seeing the ring was leaving a gray/blackish discoloration to my skin. I continued to wear it, and that worsened. I then just started wearing it outside of work, going out, or to dinner, and the discoloration continued. I fidget with my rings all day, especially during meetings. This helps with anxiety, etc. I love it!!!! Bought for my sister, ended up returning it. Doesn't spin well. Love the style of it, but unfortunately it doesn't do the one thing I bought it for. Arrived promptly, container was adequate, a bit on the cheap side. Ring is really pretty, very sleek and understated. It looks like an unique wedding band to be honest. The silver shows brightly. The spinning is smooth, it does not rattle when moving your hands. The groove is darkened and shows up the spinning ring nicely. I did measure an existing ring for my husbands size so was surprised when it didnt fit at all. Not to worry, will keep it for myself. I wanted a simple, yet unique silver ring and got one! I wear this ring everyday now. I saw this ring and thought it would be perfect. It is. It's really pretty but not flashy, so I can wear it all the time. I tend to fidget a lot, it gives me an inconspicuous way to fiddle with something. We have had a hard year starting with a car explosion and seven surgeries in between. So my anxiety level is at 11 right now. This is going to help. Kudos to my brilliant husband for a kind, beautiful, and calming anniversary gift. i love this ring so much! i'm super picky about my jewelry cause the stuff i have i wear everyday so i was super hesitant about ordering online but i'm so glad i did. this ring is worth the splurge it's so versatile it goes with everything and it looks amazing on. it's super well made. I couldn't be more thrilled & thankful for the ease of the replacement of my beloved ring. I do often use it as intended, meditation and focus. I have been a huge fan of Uncommon Goods for years. Have never had anything similar happen before. My friends and family always LOVE their Uncommon gifts! The ring pictured above has two distinct dark spaces between the spinning ring and the base. 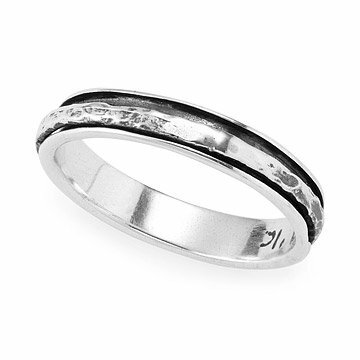 The ring I received does not have a clear divide between the sections and if you aren't looking at it closely it very well could be one piece of metal with two parallel grooves. While it is a nice ring, it does not have the aesthetic I had wanted. I also don't love the fact that it makes a very clear ratting noise when I flail my hand about (which I do whenever I'm speaking, and let's be honest, if I'm awake I'm probably talking). All in all, I'm disappointed with this purchase.